By default in a word-list you'll see the frequency of the headword plus the associated forms; if you check the show headword frequency only box, the frequency column will ignore the associated wordform frequencies. 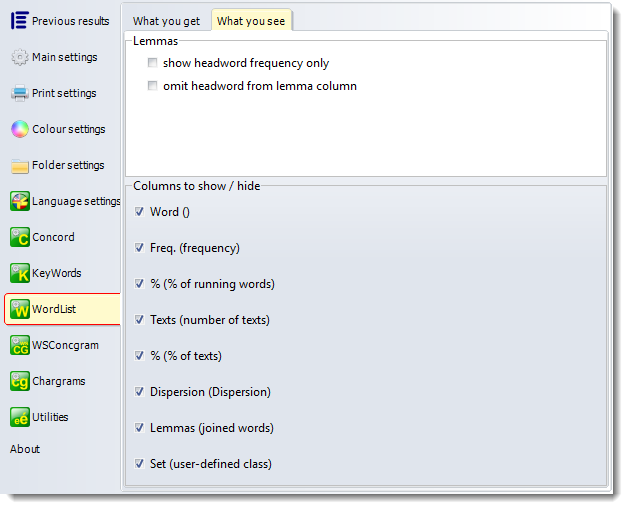 Similarly, if you check omit headword from lemma column you will see only the associated forms there. The Columns to show/hide list offers all the standard columns: you may uncheck ones you normally do not wish to see. This will only affect newly computed data: earlier data uses the column visibility, size, colours etc. already saved. They can be altered using the Layout menu option at any time.